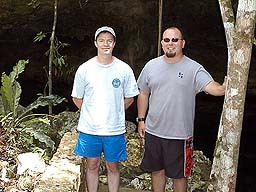 Full Cave Diver Training in the Riviera Maya, Mexico. It’s mid-august, its hideously hot outside, and I’m packing mountains of dive gear into tidy 50 lbs. packages to fly off to Playa del Carmen, Mexico where it’s even hotter! Whose bright idea was this anyway (I think it was mine)? Sadly, I eye my underwater housing in the corner and say a tearful goodbye, as I know I’ll be much too busy with cave training and just wont have any time to take any underwater pictures. Wanh! Wanh! My ride shows up at 2 AM and it’s off to pick up my dive buddy and head to airport to begin our adventure. The flights are uneventful, and we arrive in Cancun with all our gear, get our usual green light at customs and eventually found our ride to Playa del Carmen, arriving in record time due to the incredible break-neck speed of our Mexican driver! Whew! We check in at the ProTec dive shop (first things first!) and then walk right next door to good old Mom’s Hotel to check in and to verify that our gear is still in one piece. Lights are charged, batteries are in place, with a belly full of tacos (but no Cervasa) its off to bed for an early morning of fun. Friday morning, day one, and we’re up early and in search of breakfast and something resembling coffee. The only place open this early is Casa Tucan, which turns out to be a good thing, as the food and coffee are wonderful, so we'll be back! We arrive at the ProTec promptly at 08:30, and are introduced to Mike Netto (our Cave Diving Instructor - see photo) and Samuel (the third student in our class). We get started in on the paperwork and do a few hours in the classroom going over how caves are formed, what we will be doing while we are in training, and with an occasional evil grin from Mike as he describes the fun drills we’ll soon be doing. Then we’re off to Ponderosa to practice line drills on land, and then to make our first skills dive in the Open Water of the Cenote. I make the mistake of telling Mike that I already have my Cavern Certification, so he says, “good, you can show these guys how to run the primary reel on the first dive”. Oops! During our land drills, we "died" several times, not making it back to the start fast enough while in touch contact with our eyes closed. Once suited up and in the open water, we go over our equipment matching, do our S-drills, and then Mike runs a nice torturous line around the cenote for us to follow. He tells me to descend and begin following the line, and as soon as I’m on the line asks for my mask (that’s the last time I’ll be seeing that mask for about a half an hour or so). We spend about 45 minutes following the line, often in touch contact, with no masks. It’s very good training, and teaches us very quickly how to communicate with each other without sight. Mike periodically moves the line, snags your gear if you get too close or changes arrows on the line to keep us on our toes. Eventually, we get our masks back and go on to practice our different fin techniques which we will soon be using in the caves. Kicking backwards still feels a bit awkward, but hey, its working, so I'll make it pretty later. This is all new stuff to poor Samuel, but my buddy Tani and I have been using most of these for years. 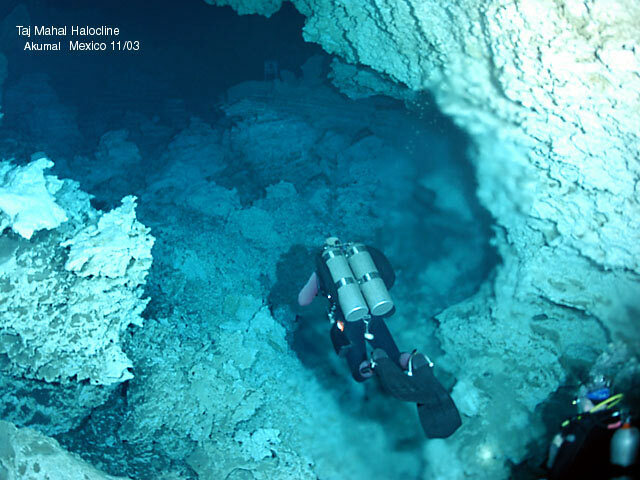 After nearly 90 minutes underwater, we surface to discuss our first Cavern dive. I get to lead and run the primary reel, and we are mostly just sight-seeing, and on exit we’ll do valve drills at our safety stop. I manage to run the reel in without too much fuss, and it’s amazing to see what the Cavern zone in Ponderosa actually looks like. I’ve been there before, but that was in the middle of massive information overload at the time, so I didn’t remember much of the cave. 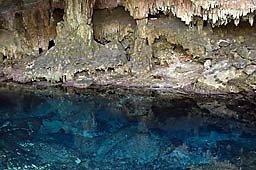 We swim through the cavern zone to the next Cenote, and turn the dive as instructed, heading back for Cenote Eden. At our safety stop, Mike points at me and indicates that I should do a valve-shutdown drill, which I whip through (its so much easier to do in warm water than in a cold, stiff drysuit). Tani is next, and has few difficulties, then we get to watch poor Samuel contorting in the water and crashing into the rocks as he attempts his first drill. All three of us are hovering nearby, with our hands on our regulators, ready to stuff a working regulator into his mouth, as it looks like he has pretty much turned off all his valves, and then attempted to try and breathe off his HID light head. Poor Samuel. At least he couldn’t hear our quiet laughter underwater! 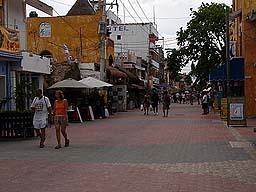 Day two dawned bright and early, and we soon found ourselves bouncing down the road to Chac Mool. A huge bus full of cenote tour divers were there, so we went off into the brush and went over lost line procedures and lost diver procedures. Once the bus left, we dropped into the Main entrance, and headed down stream into the halocline. We turned as planned (before we hit 1/6’ths) and started our lost line drills. The flow was fairly strong from the rain, and the halocline was disturbed enough, that it really didn’t matter if you had your eyes opened or closed, you really couldn’t see didly, especially when the lights were out. Mike had me turn off my light, close my eyes and then he took me off the line, turning and twisting as we swam. After a few minutes, he set me down on some loose rocks and turned off his lights, indicating the drill was beginning. I carefully attached my safety reel to the rocks, and begin slowly searching in the direction I thought the line was. I found the line at a slightly greater angle than where I had thought it would be, as the flow was pushing me further into the cave. Once I was done, Tani, and then Samuel also did their lost line drills. Then it was lights out, touch contact and we headed out of the cave. During our debrief, Mike brought out the little yellow book (which we soon learned to thoroughly dislike) and went over all of our little mistakes. He did congratulate us on being the very first class that had ever completed three lost line drills on a single dive! I guess that is progress of a sort! For our second dive, Samuel dropped down into the Cenote and swam off into the cave without the rest of his team (or his instructor). He eventually noticed that he was all alone and came back to the entrance so we could verify that we were ready to go and to check the tie offs. We then headed back downstream and did our first “lost diver” drill. Being the “odd man out” on this drill, it was very surreal watching Samuel searching for Tani, as they were way off the line, the Halocline was blurring half the picture, and the percolation was causing huge clouds of silt to roll past. Very much like a bad, drug-induced dream. Soon the team was reunited, and then it was out of air, lights out, touch contact and heading out of the cave once more. During the our debriefing after the dive, we nicknamed Samuel "Solo Diver" for his false start into the cave, which stuck to him for the rest of the week. Day Three, and we headed for Taj Mahal, where we found that another team that was already heading down the main gold line, so we headed off to the right onto a knotted exploration line. I ran the primary reel in, and we cruised downstream into the halocline until Samuel “disappeared”. Good buddy skills caught Mike and Samuel leaving the line, but we played dumb, and did the drill as instructed. When I ran my safety reel out to where Samuel was hiding, and asked him if he was OK, I didn’t get much of a response, and when I indicated he should proceed down my line ahead of me, he didn’t move. He basically sat there for about two minutes (which seems like a really long time), with both Mike and I wondering what the heck was wrong with him. Eventually, I pushed him down the line and we made it back to the knotted line. Then it was Lights out, touch contact and exit the cave. During our de-brief, I asked Samuel what was taking so long, and he told me he was pinned to the ceiling and couldn’t figure out how to get down until I pulled him down. Yikes! For our second dive, we headed downstream on the Gold line, and it was my turn to be “Lost”. This was terribly entertaining, as Mike had me leave the line at a corner, and we proceed into a side tunnel that ran parallel to the main line. We swam about 50’ through the side tunnel to an opening where we could watch the “search” taking place. Tani asked Samuel where he had last seen me, and Samuel indicated that I had gone off to the other side of the line into a large room. Mike and I were giggling like children as we watched the search going off in the other direction. Unfortunately, we were laughing too loud, and the rest of team eventually heard us, and spotted us watching from our position in the side tunnel. I was soon “rescued” by Tani and returned to the line, where it was (you guessed it) lights out, air-sharing, touch contact and exit from the cave. I was still laughing when we did our debrief. 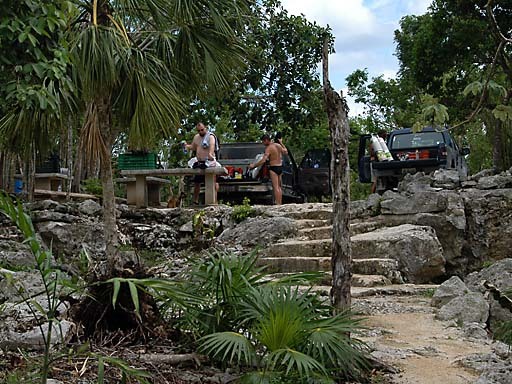 As we walked out of the Cenote and back to the truck, we ran into Dennis Weeks (pez Diablo) and Gary D from Scubaboard and TheDecoStop. It was fun to meet them both, and Dennis (Diablo Divers) is the man to call if you want guided Cenote tours in the Riviera Maya! It truly is a very small world. 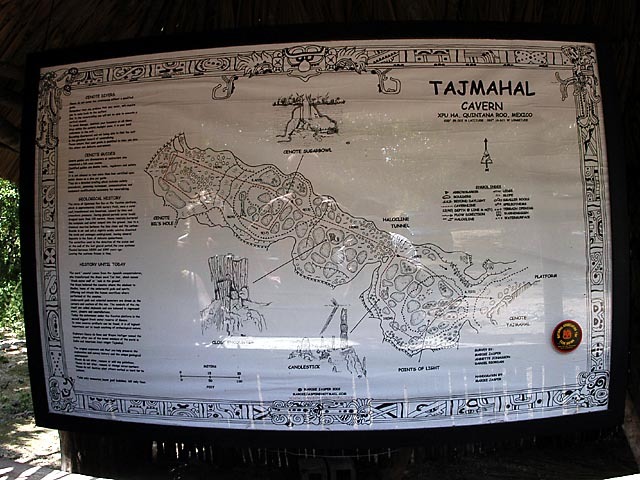 On day four, we went over Jumps and Gaps, and then headed back to Chac Mool, this time entering at the Side Entrance. We ran the primary through the restriction on the side, and then swam down the gold line until we jumped to a cave line behind the cave sign. We swam to the end of that line and jumped to another, before turning and heading back. One the way back, it was our usual, lights out, touch contact exit, which this time included a false line and marker very near our primary reel. Both of my buddies were thinking about heading down this line, but I couldn’t feel the “corner” of the gold line that I knew our primary was tied in to, so through hand placements and touch signals convinced the team to keep going. It turned out to be a good thing, as when we surfaced, Mike’s first words were, “ You both owe Scott a beer, the only reason you survived is because he figured out that wasn’t your line.” Of course the praise was short lived, and soon the little yellow book came out and burst my bubble! For dive two, I was leading again, and we jumped to a different line (knotted) past the cave sign, and then to a T, and took a right. This was the first time I used the bright orange line on my finger spool, and it works really well in the blurry halocline. Of course as we were heading out, and I was picking up the jump reels, I spotted Samuel sharing Tani's air, then we were lights out, touch contact, exiting the cave. When Mike ended the drill at our primary reel, Samuel seemed very confused, and had been breathing very hard during our exit. He was very reluctant to give Tani his regulator back, and took several minutes to get himself sorted out. I picked up most of the primary reel, locked and secured it at our 15’ safety stop, and we proceeded to do our valve drills. We had just finished our valve drills and were heading for the surface, when Tani actually sucked his tanks dry! Wow! Samuel must have been seriously hoovering during that exit! Day Five arrived, and it was time for our “Deep Dive”, so we headed off to the “boneyard” at Taj Mahal. This was to be a simulated deco dive to 80’ for 40 minutes. We had 11 minutes of deco to do by the tables, but our dive computers were going to be quite happy as most of the dive was only about 40' deep. We made the jumps to get to the boneyard, and right at the entrance, we stopped to see if everyone was good to enter the restriction and Samuel called the dive. Very peculiar, I checked my timer and we were only 12 minutes into the dive, but we turned and headed out. We did our deco stop, even though it was completely unnecessary, and then slowly surfaced. At the surface, it turned out that Samuel had turned the dive because he couldn’t read his SPG correctly and didn’t think he had enough air to enter the boneyard. We’re talking about only 12 minutes of penetration at 30’ on doubles. Are you sensing a recurring theme here? Oh well, he was sure making the two of us look good. For our second dive, we did two jumps into a highly decorated and very beautiful room. On exit, it was our usual, sharing-air, touch contact, no lights. When Mike brought out the little yellow book, our list of “mistakes” was getting very short! Progress indeed! On Day Six, we went over circuits and traverses, and then proceeded to Taj Mahal to set up and dive a circuit. I ran the reels for this dive, including two jumps, one which was through a tight restriction with quite a bit of percolation. After the second jump, I placed a cookie on the line, and we turned and started back out. Samuel was out of air this time, and I was donating, for a very long exit, in touch contact with no lights. We made it out in a very timely fashion as we had learned to move out when exiting this way, but I did notice that Samuel would take two to three breaths for every one of mine. No wonder Tani ran out of air before. We switched tanks, then went back in and completed the circuit. I got to be the “garbage collector” and clean up all of my reels and markers from the set-up dive, which was fun. Then it was air-sharing, touch contact, lights out on exit, and we were getting quite smooth and quite fast at our touch contact exits by this time. After the dive, Mike brought out his little yellow book, and there were no entries for Tani and I, which certainly brought a smile to our faces and told us we were getting much better! Day seven dawned, and we were happy campers. If things went well today, we’d graduate, and could start doing some “fun” cave dives instead of more “training”. We headed back to our old friend the Chac Mool side entrance, and ran the primary reel through the right side restriction to the gold line. We then went a short distance down the gold line and “jumped” straight down to a line hidden in the halocline. We followed this into a long, narrow restriction that had us all wondering if we were going to fit. A few tank bumps and fin scrapes later and we made it to the end of the restriction (about 80’) and to the end of the line. Samuel was leading, and was supposed to cancel the arrow at the end of the line (that was pointing the wrong way) and then ask for my primary reel to make a long jump to another line. He seemed very confused, and I indicated several times for him to place a cookie on the line, before finally getting one out myself and placing it on the line. Tani was watching our multiple exchanges, and after I placed the cookie and turned to ask if he was good to do the “jump”, he called the dive. This caught Mike off guard, which was fun to watch, and he quickly signaled that I was out of air, so I spit out my regulator and swam to Tani to share air. We re-ordered and prepared to exit, when, you guessed it, it was lights out, touch contact. Now, sharing air, blindly exiting through a long restriction may not be your idea of fun, but I was laughing when I’d occasionally bonk my head or my tanks against this poor, abused restriction. Fortunately, we were in a spot downstream that is really only used for training, and as Mike would say, “ we sacrifice here to save the rest of the cave.” We made it out in a very timely fashion, and ignored Mike’s extra lines and markers. After our usual valve drills, we surfaced, and Mike asked Tani why he had called the dive. To quote my good friend and dive buddy, “If Samuel doesn’t know what the f&*% he is doing, I’m not going any further into the cave with him!” I tried hard not to laugh, but had to agree. After a bit of discussion, Mike decided to repeat the same dive, with Samuel leading again. This time, Tani’s gas was off limits, so I knew I’d be donating to one of my two team members. We quickly made it through the restriction, picked up my cookie and then Samuel was in my face indicating he was out of air. I spit my regulator out and handed it to him, and waited, and waited, and waited. He took at least two more breaths from his regulator before he finally switched to mine. Normally, I wait until the out-of-air diver has my regulator in their mouth before I grab my backup and begin breathing, but after waiting nearly 30 seconds, I needed some air, so placed my bungeed backup in my mouth and began breathing. Eventually, Samuel switched, but seemed to have a lot of trouble clipping off his primary, and then couldn’t seem to get the hoses routed correctly. I had to free his hoses several times. We eventually got in position, cut our lights, moved into touch contact and headed out of the cave through that very entertaining restriction while sharing-air. We made it back to the Cenote with time to spare, did our usual drills at our safety stop, and watched in amazement as Samuel reeled up the primary reel, right past us, and exited, leaving us floating around beyond the secondary tie off, without a guideline. When we surfaced, Mike congratulated team stroke (as we often refer to ourselves as “Stroke Sr.” and “Stroke Jr.”) for passing our Full Cave Course. Whoo Hoo! Tani and I congratulated each other, and then were not really surprised when Mike told Samuel that he needed to do several more dives with the instructor (at no additional cost) before he would pass. I was very glad to hear that, as I had been worried that he might squeak by, and didn’t feel he was really ready yet. 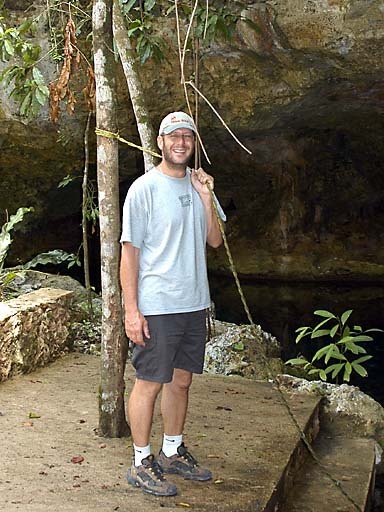 Especially as he had plans to lead Cenote tours for untrained open water divers. We were pumped up, and ready to celebrate, so we headed up Fifth Avenue in Playa del Carmen for some good food (at the Oasis), some cold beer and we were actually looking forward to a day of rest before we went on to some real Cave Diving! I was especially thankful that we had found not only an excellent instructor, but one that was extremely safe as well. My years in the oil field put a very heavy emphasis on safety, and in much of my technical training, I've been asked to do things during training that bordered on unsafe. At no time in my Cave training did I perceive even a hint of an unsafe act, and Mike's first words to us were, "the only reason I ever fail students is if they do something unsafe". I also need to thank all of my Technical Instructors, as one of the things that made our cave training so much smoother was all the years of practice we have had diving doubles, doing valve and S-drills in cold water, made those tasks so much easier to do in the cave environment. In fact, I don't remember a single training dive where Mike told us that "we had died", way to go Team Stroke! I was also thankful that Mike made us do most of our skills and drills in "difficult" conditions. We were almost always downstream with flow, in a visually disturbed Halocline, and usually in rather tight quarters, which made them a bit harder to master, but made us both much better divers. We made every exit after day one in touch contact, with no lights, which became routine and fairly easy to do after so many repetitions. I have no doubt that when we experience zero visibility for real in a cave, that we'll have no difficulty making a smooth exit. This in fact turned out to be very true, but that's another story for page two!